Engineered by Clicgear for Clicgear. 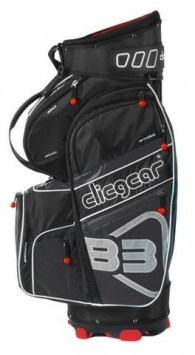 The Clicgear B3 Bag was designed to fit perfectly with all Clicgear carts. Of course it also works well with other carts and as a regular golf bag. The reason behind the B3 was the demand from customers for us to make a bag that matched the quality and design of their cart. We’re really happy with the result. The B3 Bag features sturdy construction and sold rubber bottom feet to keep it upright. There’s nothing worse than a bag that always falls over. This molded bottom also matches the Clicgear lower bag support. On the top end is a new divider system that keeps clubs organized and staggered to reduce noise. To keep the bag secure and wear free, we added a unique rubber strap system to cradle the bag. With thirteen pockets, there’s plenty of room for everything you need to bring.